Florence and the Machine teased us earlier this week with the brief (but gorgeous) video for the title song from their upcoming album (out June 1). 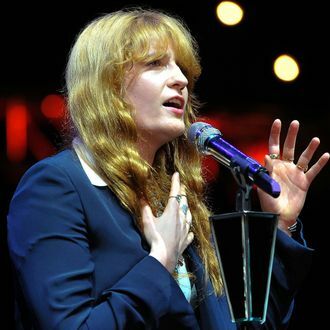 Now they’ve released its first single, “What Kind of Man,” a fiery rocker that has Florence Welch snarling about a man who did her wrong. But seriously, what kind of man would ever dare hurt Florence Welch?! Just look how amazing she is in the song’s mildly NSFW video.